Over the past generation, Weingut Jurtschitsch has become one of the most prominent wineries in Austria. Having previously being run by the three brothers Edwin, Paul and Karl Jurtschitsch, the family-owned winery has now been passed on to the younger generation, to Alwin Jurtschitsch and his wife, Stefanie Hasselbach (of Gunderloch fame in the Rheinhessen). Alwin and Stef are leaders in the natural wine movement in the Kamptal. It’s a unique story because they happen to have the oldest winery in the area, dating back to the 16th century. It was purchased by Alwin’s family in 1868. When he and Stef started working at the winery in 2006, they insisted with Alwin’s father and uncles on converting all of the vineyards to organic viticulture. For the amount of work that organic viticulture takes, the first step was to rent out some of the land that they own. They used to have 80 hectares and now they are working with 60 hectares so that they can focus on quality rather than quantity. All of the vineyards are certified organic. David Schildknecht in February 2016, described the Jurtschitsch wines as, “strikingly delicious, complex, and compulsively drinkable.” Jurtschitsch is going for a classic style of Kamptal wines, but more like an old-style of classic. A lot of what you find in the Kamptal pushes ripeness and Jurtschitsch concentrates on keeping freshness and elegance rather than power. The wines show restraint – each very expressive of its terroir. The wine philosophy also underwent a transformation: “Our wine style became more ‘polarising‘, characterised by the idea of terroirs without compromise”, says Stefanie Hasselbach. Their most famous vineyard is the Riesling Heiligenstein, the greatest site in the Kamptal with an exceptional terroir of desert sandstone and volcanic conglomerate. In the vineyards, Stef and Alwin they are continually trying to improve how they work. They are replanting more densely. One current trial is using whey exclusively in certain vineyards to treat for mildew instead of using copper/sulfur. They are also working with new pruning methods. Protecting biodiversity has always been a priority. In their vineyards, you find fruit trees, grass, garlic, wildflowers and butterflies. In the cellar, they produce wines which let the vineyards and soils speak for themselves. They only use spontaneous fermentations and work without any additions, aside from minimal sulfur. The entry level wines are made in stainless steel, but all of the single-vineyard Erste Lagen wines are aged in large oak foudres. The wines shine in multi-faceted elegance, offering drinking pleasure at highest level without being baroque and heavy. The Grüner Veltliner wines interpret the Kamp Valley’s spiciness at its finest, while the Rieslings impress with their crystalline minerality. The renowned Gault Millau wine guide most recently called the Jurtschitsch winery “the most exciting one in Langenlois at present”! 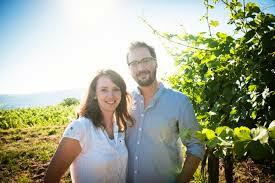 The young couple has begun a new project to make wines that they call “discoveries from the Kamptal”. All of the wines that they make would be classified as natural, the wines with the “J” label are classic in style and they wines with the artsy floral labels are what Alwin likes to call his, “freaky” wines. This is there chance to go outside of the ‘classic’ style boundaries and to work with skin maceration, full malo, very low sulfur and no filtration. We will start selling these wines in the US from this September in limited quantities.